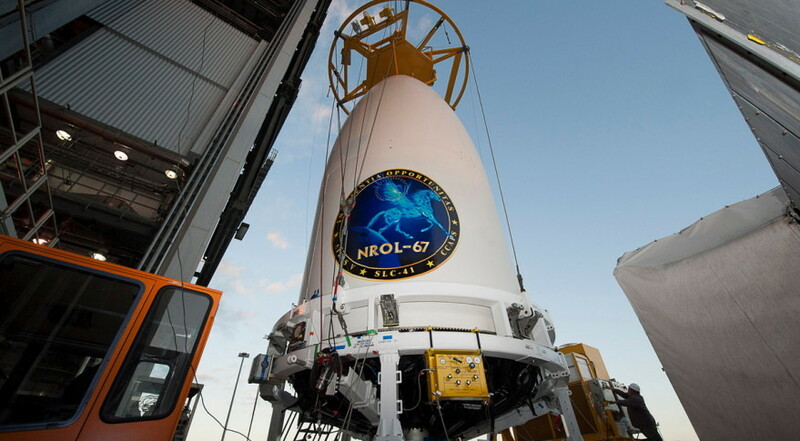 The NRO's classified NROL-67 mission launched in 2014 aboard a United Launch Alliance Atlas 5 rocket. WASHINGTON – The U.S. Air Force awarded United Launch Alliance a $373 million contract modification to build two rockets for the National Reconnaissance Office as part of its $11 billion block buy from the service, according to a Nov. 12 announcement from the Defense Department. The modification calls for one Atlas 5 rocket with a four-meter fairing and two solid strap-on motors and one Delta 4 Heavy rocket. ULA’s sole-source block buy contract, awarded in 2013, includes production of 36 new Atlas 5 and Delta 4 rocket cores and launch services for vehicles ordered as far back as 1998. That contract covers launches for the Defense Department and the National Reconnaissance Office, the Chantilly, Va.-based agency responsible for the design, construction and operation of the United States’ network of intelligence-gathering spy satellites. Because NRO missions are classified, very few details about the launches or the satellites they carrying are publicly released. The work is expected to be completed by January 30,2019, the announcement said.